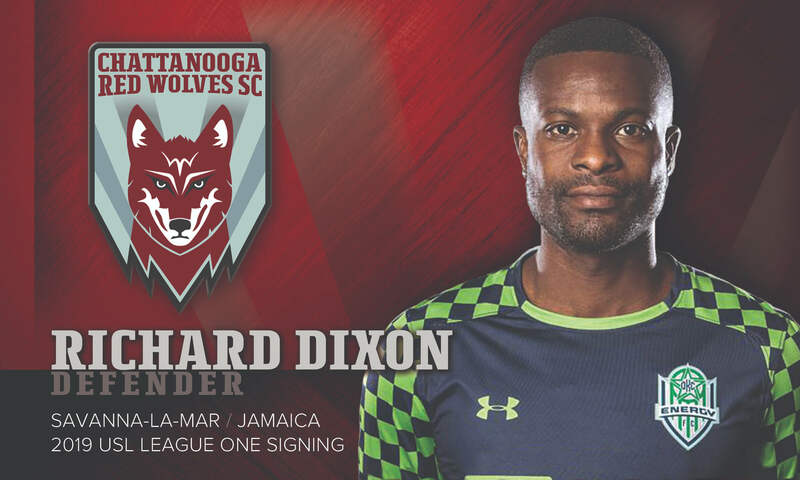 Chattanooga Red Wolves SC has signed Jamaican defender Richard Dixon to its USL League One team. Dixon will join the franchise for its inaugural season in 2019 from USL Championship's OKC Energy FC, pending league and federation approval. Dixon joined Energy FC ahead of the 2017 season, appearing in 26 of the team’s 32 regular season matches, totaling 1,975 minutes played and collecting one assist. During the 2018 season, Dixon appeared in 25 matches, totaling 1,733 minutes played, with one assist. According to Tim Hankinson, head coach and technical director for Chattanooga Red Wolves SC, Dixon’s experience from competing five seasons in the USL is a valuable asset to Chattanooga's roster. Prior to Energy FC, Dixon spent two seasons with USL Championship’s Saint Louis FC. During his last season with Saint Louis in 2016, he appeared in 26 games, logged 2,125 minutes played, added three assists and was named to USL Team of the Week. In addition, Dixon was invited to compete in the Copa America and Gold Cup with the Jamaica Men’s National Team in the summer of 2015. Dixon signed his first professional contract in 2013 with VSI Tampa Bay FC. Following the single season, Dixon signed with USL Championship’s Charlotte Eagles for the 2014 campaign. Dixon’s collegiate career was spent at the University of West Florida (UWF) under head coach Bill Elliott. Dixon was a standout member of the Argonauts’ back line from 2008-12 and was named the Gulf South Conference Player of the Year in 2009 and 2012. He is the only player in UWF's history to be named a four-time NSCAA All-South Region team member. He joins the Red Wolves SC roster as the ninth player signing for the club. Other signees include Greg Hartley, Éamon Zayed and Steven Beattie.